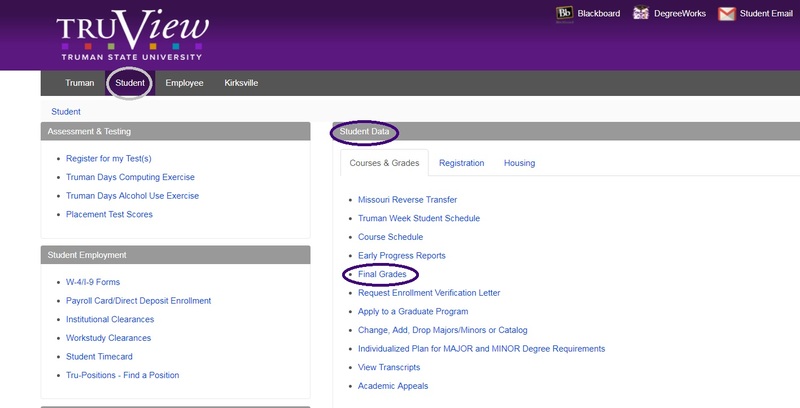 A week or two after completing the course, Dual Enrollment Computer Science students can view the grade they received by logging in to Truview, selecting the Student Tab, and clicking the “Final Grades” link in the “Student Data” menu. If students are enrolled in an associated high school class, high school grades are assigned by the high school teachers at their discretion. Typically these grades are the same as those offered by the University, but if a local teacher adds additional homework or assignments, the grade could differ. Be sure to check with the teacher at your school to determine their intentions with respect to the local grade. Since most high school classes do not conform to the schedule of a normal college semester, grade entry may be required for Truman students before your semester has ended. Thus, Truman will record a grade of IC (or “Incomplete”) or NS (not submitted) until the point at which the student’s final grade is submitted. If a student withdraws from the course, they will receive a W grade on their Truman transcript, denoting their withdrawal. A student can remove this W grade by retaking the course to replace it with an earned letter grade. Grades earned in a Dual Enrollment Biology course (except for W and IC grades) will affect the university GPA of students who later choose to attend Truman. Each student that signs-up for a Dual Enrollment Biology course will have a Truman transcript that lists the course they signed up for and the grade they earned – just like a regular Truman student. Unofficial Transcripts: Students can view and print their unofficial transcripts by logging in to TruView, selecting the Student tab, and clicking the“View Transcripts” link in the “Student Data” box under the “Courses & Grades” heading. (Note: Grades for Dual-Enrollment Computer Science courses may not appear on students’ transcripts for up to two weeks after the student has completed the course). Official Transcripts: Students can request their official Truman transcript to be sent to them or to a third party (such as a college or university to which they wish to apply) by visiting the Registrar’s transcript request page. Note: Students who have not paid their account balance in full or submitted an accurate social security number to Truman will have a hold placed on their account that will prevent them from being able to send their transcript until their balance is paid and/or the number is provided. Students who complete a Dual Enrollment Biology Course with a grade of C or higher can transfer the credit to any school that accepts Truman State University credit. To determine whether or not a certain school will accept transfer credit for these courses contact the registrars office at the school and provide them with the course description (see below). To transfer credit to another school, students should first contact the school’s registrar’s office to determine to what address they must send their official transcript and what process the school requires students to complete in order to submit credit for transfer (they may require students to fill out forms, meet with an advisor, etc.). A student’s Truman course grades may or may not be included in their GPA at another college or university when transferred, depending on the school’s transfer policies. Students should contact the registrars office of the college or university to which they are interested in transferring the credit to see what the school’s policies are regarding transfer credit.